The landscape of medical science is on the verge of being radically altered forever by the use of a powerful microscope (the Somatoscope) developed by Gaston Naessens of Quebec, Canada, This incredible device reaches magnification levels of 20,000 to 30,000 diameters—well above the 2,500 diameter limit of conventional microscopes. The sheer magnitude of the difference in performance gives the appearance of either a gross violation of the laws of physics, or fraud. Its radical departure in performance from optical and scanning electron microscopes registers this as a truly great discovery. Unfortunately, in most fields of science, a great deal of effort is put forth into listing why something will not work instead of attempting to duplicate the results. This in turn creates a situation where what was science, turns into religion where the orthodox dogma is to be taken on faith, and that which defies dogma is to be persecuted as heresy. Establishment of a dogma slows down the rate new discoveries can be made. In the medical fields, slow acceptance of new ideas can cause many needless deaths. This is the case with the supermicroscope and the discoveries of B&hamp, Rife and Naessens. In the 1930s, an obscure and dedicated scientist, Royal Raymond Rife, had successfully developed the Universal Microscope which was able to provide amplification levels of 60,000 times without killing the specimens! Rife was able to observe live viruses and their reaction to certain stimuli. His observation that bacteria could change into viruses and viruses could change form, violated the strongest medical dogma—the germ theory of disease. By 1934, after learning how to seek out and destroy the insidious cancer virus, Rife opened a clinic in which he cured 16 out of 16 patients within three months! Working side by side with some of the most respected researchers in America, Rife treated patients electronically to kill the virus and then allowed the body's immune system to restore the body to full health. Many prestigious (and competent) organisations and institutions over­saw and verified much of Rife's work during the 1930s. Independent physicians using Rife's therapy were treating and curing as many as 40 patients per day. Other degenerative conditions and illnesses such as cataracts, herpes and tuberculosis were found reversible and curable with Rife's equipment This work was described in various medical journals of the time as well as the Smithsonian Institution's annual report and Science magazine. Unfortunately, Rife's success attracted the attention and wrath of the American Medical Association (AMA) and the powerful pharmaceutical companies—the organised opposition of the medical fields. Although Rife's work was in direct conflict with the orthodox views of his time, he was supported by many top-rated doctors. Many of these doctors continued using these devices in secret in defiance of the AMA and the US government. The carefully documented records kept by these brave doctors and testimonials by their patients vindicate Rife's theories. Many of these case histories and anecdotes about Rife's treatment can be found in the book, The Cancer Cure that Worked! by Barry Lynes. The fascinating work of Rife was suppressed and he—like Tesla before him—joined the ranks of the forgotten inventors of the early part of this century. It has only been in the past few years that the general public has begun to develop an awareness that there is something wrong in the technical world. What Rife accomplished optically in the 1930s with his Universal Microscope, Gaston Naessens accomplished with a combination of optics and electronics in the 1940s in his Somatoscope. Born on 16 March 1924 in Roubaix, France, Gaston displayed a predisposition to be an inventor when at the age of five he built a little moving autolike toy from a Meccano set and powered it with an alarm clock spring. Later, he built a home-made motorcycle and a mini-airplane! While attending the University of Lille, Gaston nearly had his education disrupted by the German invasion. Fortunately, Gaston and his fellow students escaped to Nice where they carried on their education in exile. He was awarded a diploma from the Union Nationale Scientifique Francaise—a quasi-official institution under whose auspices the education of the displaced students continued. He did not bother seeking an equivalency degree from the de Gaulle government when the French rule was restored. At the young age of twenty-one, frustrated by the limitations of conventional microscopes, Gaston set out to build a superior microscope. Technical assistance was provided by German craftsmen from Wetzlar, Germany, who checked out many of Gaston's original ideas on optics. Privately, Gaston devised the electrical manipulation of the light source Once the technical aspects were resolved, Gaston had the body of his microscope constructed by Barbier-Bemard et Turenne, technical specialists and defence contractors near Paris. The Somatoscope mixes light from two orthogonal light sources—a mercury lamp and a halogen lamp. The light from both sources enters a glass tube at 90° from each other. As the light waves beat against each other, a strong carrier wave of light emerges and travels down the light tube. (It should be noted that two electromagnetic fields superimposed upon each at 90° is a classic scalar formation!) As the light travels down the tube, it passes through a monochromatic filter which forms it into a mono­chromatic ray. The ray is then passed through a large coil that sur­rounds the tube. The coil's magnetic field divides the ray into numerous parallel rays that are then passed through a Kerr cell which increases the frequency of the rays before being injected onto the specimen. 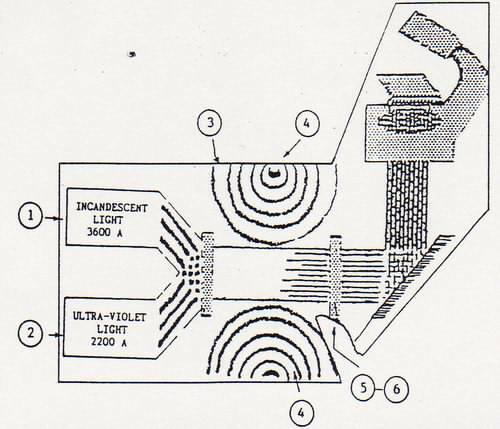 The light, which contains the carrier and a mixture of selected signals in the UV range, stimulates the biological material in the Somatoscope to the point that the specimens give off their own light. (Rife referred to this as luminescence.) This is the key to the ultra-high resolution that has been achieved by Gaston Naessens. Conventional microscopes pass light through the specimen which theoretically limits the resolution of optical microscopes to the wavelength of light. The finest optical microscopes have achieved magnification levels of 2,500 diameters. At levels above this, the resolution is limited by the wavelength of light and further magnification merely creates a blur! Higher resolutions have been achieved by microscopes which do not use lenses, but rather apertures which are smaller than the wavelength of light. One such microscope engineered in Cornell University has achieved a resolution of 400 angstroms—a far cry from the 150 angstroms achieved by Naessens' Somatoscope. The Somatoscope does not attempt to illuminate the specimen by passing light through two small objects. Instead, the illumination source is actually stimulating the specimen to the point it generates its own light. The light itself expands as it moves outward and because the specimen itself is generating the light, the physi­cal restrictions encountered by regular optical microscopes do not apply. By converting the specimen into a light source, Gaston Naessens has converted the magnification problem from one of resolution to that of light detection! At magnification levels above 5,000 diameters, light levels drop off the point that film is neces­sary, but the resolution is there. To further research along the lines he has pioneered, Gaston has developed junior models of his Somatoscope for field use. These field units allow researchers to obtain illumination and stimulation of the specimens of the larger unit. The field units are capable of magnifying 6,000-7,000 diameters, although routine work will usually be at 3,500-4,000 diameters. The lower light levels of the higher magnification requires that a lower level of magnification be accepted for field use in order to maintain portability in the smaller units. One such unit will be in use in Colorado Springs at Clifford and Associates. The Somatoscope has enabled researchers to discover the importance of colour and its relationship to the material being observed. The wavelengths of light generated are related to the size of the object and the health of the cell. For instance, the red blood cells vary from yellow/green to orange (540 nm to 580 nm) and white blood cells are rich in blue/violet (490 nm to 510 nm). Exposure to toxic materials, even in minute amounts, causes significant shifts in colour. Even 'safe' amounts of toxic materials like mercury and the aluminium in toothpaste cause significant degradation to red blood cells as I was able to witness from specimens on a videotape produced from the Somatoscope. In a long lost chapter of history in science, a violent controversy took place in France between the illustrious Louis Pasteur and Antoine Bechamp, a noted professor of physics, toxicology, medical chemistry, and biochemistry. 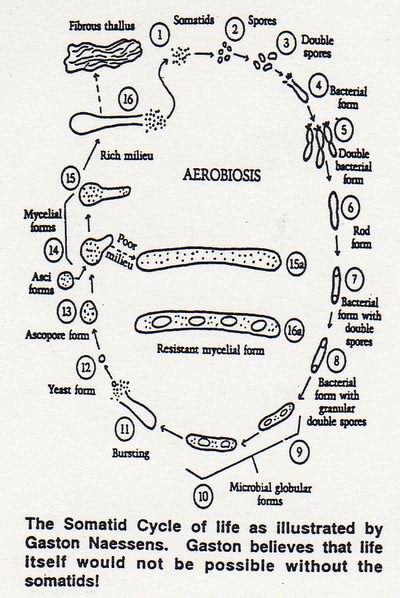 Bechamp's work led him to discover 'microzymas' (tiny ferments) which were characterised by a host of small bodies in his fermenting solutions. After years of study, Bechamp came to the conclusion that these microzymas were more basic to life than cells. Even with his crude equipment, he was able to observe that the microzymas underwent dramatic transformations during their life cycle. This caused Bechamp to champion the idea that the cause for disease lay within the body. Pasteur's germ theory held that the cause came from without Pasteur's outspokenness helped the germ theory win out and dominate medical philosophy for the past century. Now, a hundred years later, Gaston Naessens has discovered an ultramicroscopic, subcellular, living and reproducing microscopic form which he christened a 'somatid' (tiny body). This new particle could be cultured outside the bodies of the host. Naessens also observed that the particle had a pleomorphic (form-changing) life cycle, and had a sixteen-stage life cycle. Only the first three stages of the somatid life cycle are normal. Naessens discovered that when the immune system is weakened or disrupted, the somatids go through the other thirteen stages. The weakening of the immune system could be brought about by a number of reasons such exposure to chemical pollution, ionising radiation, electric fields, poor nutrition, accidents, shock, depression, and many more. Incredibly, Naessens' research has resulted in the association of degenerative diseases (rheumatoid arthritis, multiple sclerosis, lupus, cancer and AIDS) with the development of forms in the sixteen-stage pathological cycle. The ability to associate the disease with specific stages has enabled Naessens to 'prediagnose' conditions in advance of when they would clinically appear. This discovery puts Gaston Naessens at odds with the orthodox medical philosophy today which has embraced Pasteur's germ theory wholeheartedly. Naessens' work is repeatable. The ability to culture somatids is a bellwether to the rewriting of microbiology! "I've been able to establish a life cycle of forms in the blood that add up to no less than a brand new understanding of the basis of life. What we're talking about is an entirely new biology, one out of which has fortunately sprung practical applications of benefit to sick people, even before all of its many theoretical aspects have been sorted out"
The research of Gaston Naessens has culminated in the discovery of 714X—an enzyme which helps the immune system to do its job. 714X is a derivative of camphor and is injected interlymphatically—a process that the medical fraternity holds to be impossible. Yet the fact remains that many people have learned how to administer the medication through lymph nodes. When properly administered, 714X stabilises and strengthens the immune system in most cases. This allows the immune system to go about its normal business in ridding the body of disease. In other words, cancer is treated like an infection, not a state of cells. Like Bechamp and Rife before him, Gaston states unequivocally, "germs are not the cause of, but the result of, disease". The cancer death toll between 1970 and 1986 was approximately 6 MILLION. Sadly, the conventional treatments of chemotherapy and radiation therapy are nothing more than slow death sentences that enrich the cancer industry. Possible miracle cures are quickly quashed by the FDA (Food & Drug Administration) and the various medical societies around the world. It is a sad commentary that in a country that prides itself on freedom, terminally ill patients cannot make an informed decision to participate in experimental treatments that may save their lives. 714X is available in the United States. WRITERS & RESEARCH is one organisation working closely with the FDA and the IRB (Institution Review Board) to do work with 714X legally and ethically. 714X is an injected medication and must beprescribed by a doctor.